The contemporary looks of Dial’s® White Marble soap and amenities collection complement any bathroom decor. This trusted amenity soap is available in various presentations in standard rectangular bar sizes. It has been synonymous with user satisfaction and trust in North America for decades. White Marble soap and amenities are manufactured in our Aurora, Illinois factory and marketed through Transmacro Amenities. 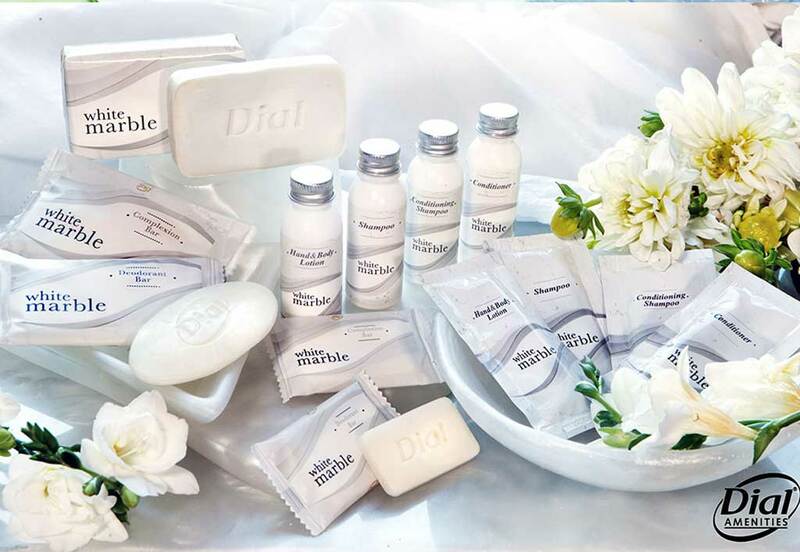 With our White Marble soap and amenities collection, your customers will be placing many orders to keep up with demand. The White Marble Basics® bar is a mild cleansing soap that leaves skin moisturized and fresh. The hypoallergenic formula has no harsh chemicals, fragrance or other ingredients that can cause irritation. Deodorant bars contain a widely used active ingredient that will provide a fresh and clean feeling all day long. The well-known Tone® is a skin care bar soap that benefits from cocoa butter, a preferred natural ingredient that promotes healthy moisture levels in users’ skin. Cocoa butter has long been known for it’s beneficial properties and miraculous benefits to the skin. This rich formula and a mildly pleasant scent make this popular item an excellent choice. Breck® branded liquid amenities shampoo and conditioner are enriched with Aloe Vera extract. These outstanding amenity liquids satisfy any discriminating users expectations and your customers will keep coming back for more!